UPDATE 11:40AM—Police have clarified that the Racine/Clybourn incident occurred in the 1600 block of West Armitage. DePaul Public Safety earlier provided the Clybourn/Racine location. Our original report follows. Six DePaul University students were robbed in three separate hold-ups on and near the school’s Lincoln Park campus early today. No one is in custody and the same robbery crew is believed to be responsible for all three cases. Around 12:20 a.m., a DePaul student was robbed at Clybourn and Racine by four men armed with two handguns who emerged from a white Audi SUV, according to an email distributed by DePaul Public Safety early today. Within minutes, a second robbery was reported outside of Roy’s Furniture, 2455 North Sheffield. In this case, four DePaul students were robbed at gunpoint by a group of offenders who emerged from a white Audi or BMW. 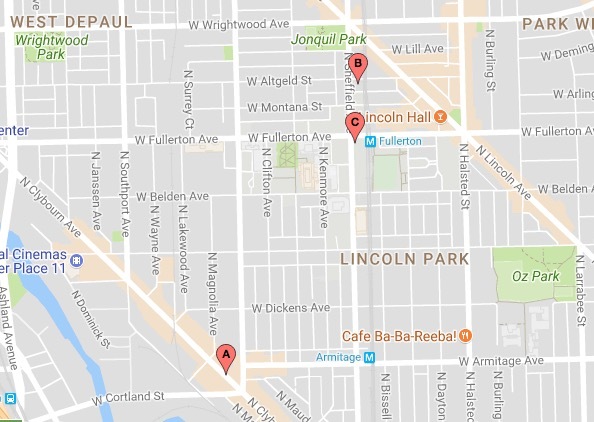 Approximate locations of three robberies this morning that involved DePaul students. Around 12:25 a.m., two men jumped out of a white Audi in the 2300 block of North Sheffield and demanded a student’s belongings. The victim handed over a backpack containing a laptop, which the offenders took before returning to the vehicle which headed southbound, according to police and DePaul officials. No gun was displayed in the third robbery, but one of the robbers said that he was armed. Public safety news first and in detail. Exclusively from CWBChicago. Please support our efforts.